The long-running Airbus versus Boeing transatlantic trade war over government subsidies for airliner development has flared up again, with Boeing proclaiming US compliance with a March 2012 World Trade Organisation ruling to redress "relatively small" subsidy infractions while redoubling its insistence that Airbus has continued to "thumb its nose at the WTO". 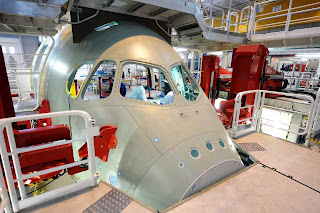 Speaking for the Airbus side of the dispute EU trade spokesperson John Clancy countered: "We will now immediately review their compliance package to check whether the US have taken the necessary steps to end these subsidies and their adverse effects." According to Boeing, US government action has addressed subsidies that the WTO in March identified as inconsistent with its rules. "Unfortunately," Boeing said, "the same cannot be said of Airbus and its government sponsors, which have thumbed their noses at the WTO. Despite a crystal clear ruling against launch aid subsidies, European governments have continued the practice by providing Airbus with billions of taxpayer euros and pounds for its next new product, the A350 XWB. The illegal subsidies to Airbus, most importantly the pernicious, market distorting practice of launch aid, must stop. The US government remains committed to ending these subsidies, and Boeing fully supports the actions the US government has taken to ending them." Based on article "Boeing insists ‘illegal’ A350 launch aid still flowing to Airbus" published on Flightglobal.